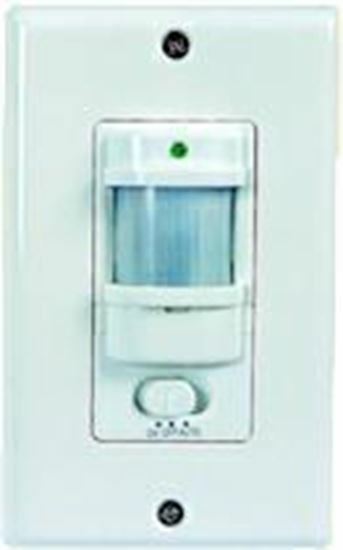 Infrared Motion Sensor Occupancy Wall Switch. This new energy saving Passive Infrared wall switch utilizes an integrated circuit manufactured with the latest surface mount technology, has excellent detection sensitivity and a rapid response time. Its design incorporates automatism, convenience, safety, energy-saving and practical functions. The wide detection range senses an up, down, left and right field of motion. It works by seeing human body heat in motion via infrared rays. It is designed to replace an existing wall switch for interior lighting. It can start the controlled output load (light) immediately when a person crosses the detection field and it will not switch on unless the room is dark or dimly lit. The unit incorporates a simple three wire installation, a status indicator LED light and built-in photocell. This switch controls: incandescent bulbs, LED bulbs, compact florescent bulbs (CFL) and florescent fixtures with Electronic Ballast. Relay motion sensor occupancy switch. No flickering light on CFL and Florescent Bulbs with Electronic Ballast. MAKE SURE TO TEST THE POLARITY OF THE WIRES ON ALL INSTALLATION POINTS. 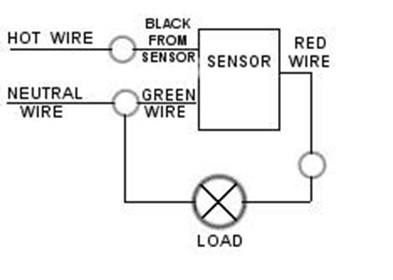 COLORS OF WIRES DO NOT NECESSARILY MEAN IT REPRESENTS THE CORRECT WIRE POLARITY. • Detection field: The sensor scans up, down, forward, left and right (see the following diagram). There is a relationship between the sensitivity and the orientation of motion. Detection sensitivity is ideal when motion is perpendicular to the sensor. • The sensor will identify high ambient light conditions and keep the light from switching on. The actual light level threshold is pre-adjusted at 10 LUX. • Power and detection indication: The LED will continue to flash regardless of the switch position. It will flash fast when it senses movement and it will flash slowly at the end of the timing cycle. • Cumulative time-delay: When the sensor detects movement for the second time it resets the timer and the countdown starts again from the beginning. This action repeats until movement is no longer detected and subsequent to the end of the time delay the switch output shuts down. • Time-delay adjustment: It can be set according to the consumer preference. The minimum time is 8 seconds and the maximum is 7 minutes.